FCG Truck Driver Training School is the most prestigious truck driving school in the entire Midwest. 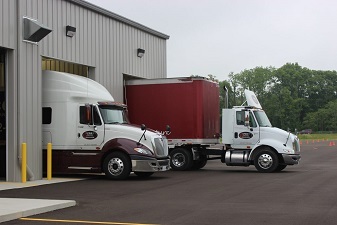 Established in 1989, FCG is the oldest truck driving school in West Michigan. Over the years, FCG has developed hundreds of relationships with Michigan based trucking companies that hire our students once they graduate from our school. Furthermore, with the opening of our new five acre campus, FCG is without a doubt the most technically advanced school in West Michigan. Looking for drive time? No other school provides more drive time for students than FCG Truck Driver Training School. We are proud to provide our new students with state of the art equipment, world class training from Instructors that are State-Licensed – Michigan (Credentials available upon Request) and most of all, dedication and commitment, to achieving the goals and objectives, of the most important element of our success over the last quarter century…our students!!! We offer a group of highly capable and esteemed career counselors that carry commercial drivers’ licenses and have years of experience. They are willing and able to answer all of your questions and manage your expectations throughout your training as it relates to becoming a “professional” truck driver. CHANGE YOUR CAREER, CHANGE YOUR LIFE!! Some of our students successfully graduating from FCG Truck Driving School will have an opportunity to be placed with a selection of desired trucking companies located in the state of Michigan. Most national and regional trucking companies offer driving positions to successful graduates of our school and some offer full or partial reimbursement of your tuition fees. Furthermore, if you are looking to go over the road, signing bonuses of well over a thousand dollars are not uncommon in this highly skilled, in demand field of professional truck driving. Click here to view a list of current job postings from some of our customers. WHY FCG TRUCK DRIVER TRAINING SCHOOL YOU ASK? Pick up the phone and call one of our experienced career counselors now. Find out the answer to that question from someone who knows what it’s like to make such a major career decision as the one you are facing today. Ask them to tell you how it changed their life. If you do, you will find the answer to this important question and more than likely, you will get a good story or two about what it’s like to become, a professional truck driver!!! Financial or government assistance programs may be available to you.